There are many possible driving routes to the Department of Deux Sevres from England. We have selected some motorway routes from the major ports to help you. Roscoff............................................................... 6 hours 9 minutes. Our nearest Airports are: Poitiers and La Rochelle. Route maps from these airports can be found below. La Rochelle........................................................ 1 hour 17 minutes. 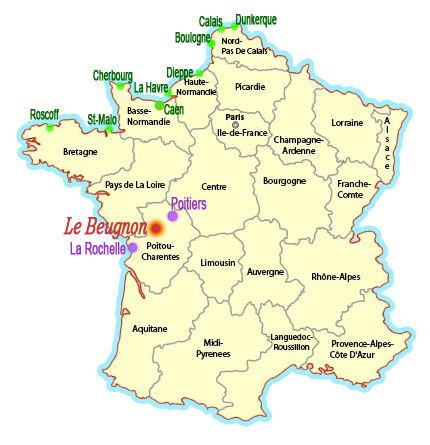 We are situated in the heart of rural South-West France and generally the Summer months here are beautifully sunny. Because of this, it means that you can enjoy some great outdoor activities right here on the door-step! Cycling and walking are very popular in this area. A small selection of these activities are listed below and when you arrive, there are a large number leaflets available to you. And for those of you who just wish to relax and enjoy the tranquility of the area, we have available a plethera of holistic therapies. (Eg. Reiki, massage, facials etc). Early booking is recommended. Please enquire for further details. Vallée du Thouet Many things to see and do along the River Thouet from Saumur. Including walking, cycling, kayaking, fishing, parachuting... Cycle hire is available locally. Marais Poitevin The "Green Venice" of Deux-Sèvres. Take a boat trip along the beautiful waterways. Saumort Horse Riding Indoor and Outdoor horse riding facilities at this family-run business. Futuroscope A great day out for all the family. Visit Niort Niort is the capital of the department of Deux-Sèvres. It has fabulous food halls, market, shops and restaurants. Parc Aventure Adventure park in the trees! Fun for all, ages 5 and up. Puy du Fou Theme Park for all the family. Visit La Rochelle A beautiful town, port and beach. Has an old town with markets, shops and quayside restaurants. Aquarium A wonderful Aquarium at La Rochelle - definitely worth a visit! Parc Oriental A gardener's paradise! A wonderful open garden, oriental style - there is also a night showing available. Wine Tasting Based in the Vendée, J. Mourat will share with you their wines and a tour of the vineyards. If you would like to check availability or to book any of our rooms, please complete this short form, and press 'send'. We will respond to your enquiry as soon as possible.